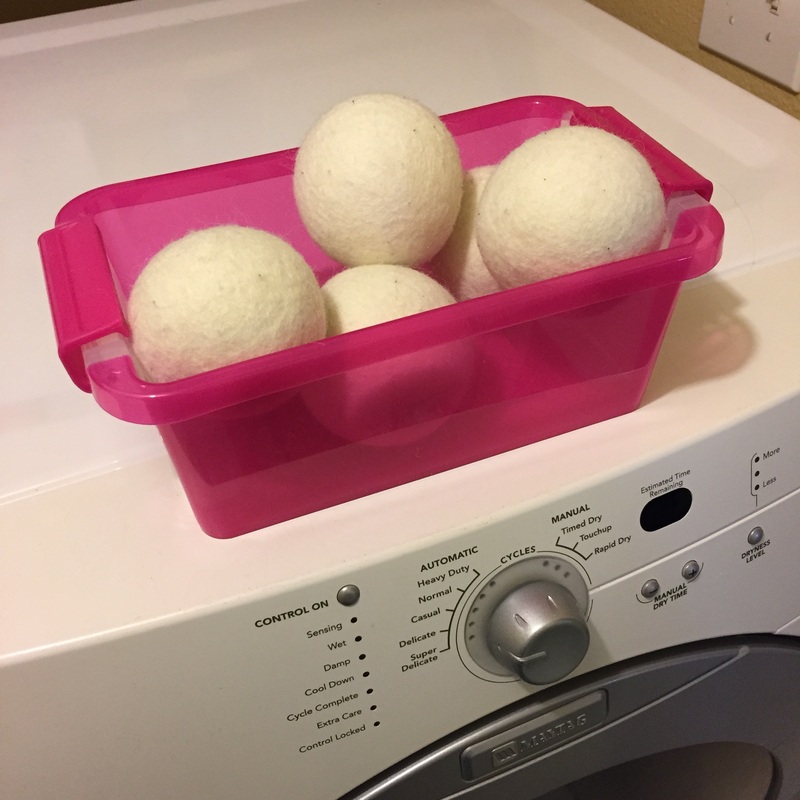 Wool Dryer Balls…. You dirty minded people! I started using these dryer balls a couple of days ago in lieu of fabric softener. There are a lot of claims made about dryer balls that I have to admit I was pretty skeptical. Since I’ve only been using them a couple days, this is just an initial assessment, we’ll see how I like them in the long run! Initial Opinion: I LOVE them! 1- These really do soften laundry without chemicals. In fact, it may just be my imagination, but I really think the laundry is coming out of the dryer SOFTER than it was with fabric softeners. 2- I love that these have no chemicals and they don’t leave a funky residue on the dryer like fabric softeners and fabric sheets. My family has VERY sensitive skin and there is nothing to react to with these dryer balls. I love that I don’t have to use the “natural fabric softener sheets” with my baby’s laundry and even though it’s a small thing, that’s less stuff going into a landfill. 3- I can scent these with whatever essential oils I choose or none at all. I haven’t found the best ratio of drops of oils to dryer balls yet as I don’t seem to be putting enough on them to catch a discernible scent when clothes come out of the dryer, but I’m working on it. =) I’m shooting for just a light whiff. 4- There seems to be a lot less static with these, if there’s even static at all. Usually when doing my husband’s white undershirts they’re always sticking together. I just folded a load of these and there was no sticking at all! 5- LESS WRINKLES! So I’ll (shamefully) admit, both my husband and I usually cram a ton of clothes into the washer, which then equals a ton of clothes in the dryer, and we always usually have some wrinkles. There are a LOT LESS WRINKLES per load than before. Side Note: Must learn to put less laundry in the wash at a time. 5- Drying time is greatly reduced. Again, because we (shamefully) cram a ton of clothes into the wash, we generally have to tumble a load 2-3 times to get completely dry. My clothes are getting dry in one tumble, and that’s not only less time doing laundry, but less electricity used running the dryer! So far, I LOVE THESE DRYER BALLS. Supposedly they also knock pet hair off clothes really well, but I haven’t really put that to the test yet. They also supposedly last up to a year, so we’ll see if they continue to perform as well in the long run. Handmade Essential Oil Diffusing Jewelry! Wow – we were really busy this weekend! I was so ready to be done with this week at work that the weekend had been looming for me for what seemed like forever and it was finally HERE. There is a very small historical cemetery near our house that over the last few months had become quite overgrown. It really made me sad driving by it 1-2 times a day and thinking about how if those were my ancestors I certainly wouldn’t be happy with the neglect the cemetery was going through. Finally after contacting the owners of the cemetery and finding out the people in charge had just kind of forgotten about it and would be unable to do anything about it for a while, I decided to do something about it myself! I organized a bunch of people from Murphy, and we all went out there Saturday morning for the big CLEAN-UP! Here’s our album of pictures from McMillen Cemetery Clean-Up Day! I really love them all, but the one of her yawning gets me every time. ❤ Getting so much closer to meeting her in person, it’s really flying by at this point! Once we got home we headed to the pool. MAN all the rain on Thursday made that water FRIGID. Wade was making fun of me because once I got my feet in it took me almost an hour to get the rest of me in the pool. He kept telling me I was freezing our baby, but honestly, it felt a lot better than my hot stuffy house with no AC! We ended up going to dinner with Dad at Cracker Barrel – it’s his birthday tomorrow and he’s bacheloring it this weekend while my mom is at the beach so we’re meeting up with him as much as we can! And now I’m sweaty, exhausted, and ready to go to bed! I know it’s been a long while since I’ve posted, but I’ve missed blogging and I finally have some interesting stuff (I believe anyway!) to add to the interwebz again. The past two and a half years have been a long hard road for Wade and I as we’ve struggled with infertility issues. We didn’t publicize that we were trying to start a family, but it was something we both really desperately wanted and didn’t seem to be able to achieve. After a really disheartening last six months to 2013, we decided to quit the road we were currently on and save up the money to start IVF in March 2014. You can imagine our surprise (and elation!) when at the beginning of February, I (being the obsessive can’t help it person I am) decided to pee on yet another pregnancy test (I should have bought stock in First Response 2.5 years ago) and it came back POSITIVE! I wanted to scream our joy from the rooftops, but being surrounded by fertility issues (and hundreds of other women surrounded with the same issues) for years had made me super paranoid. 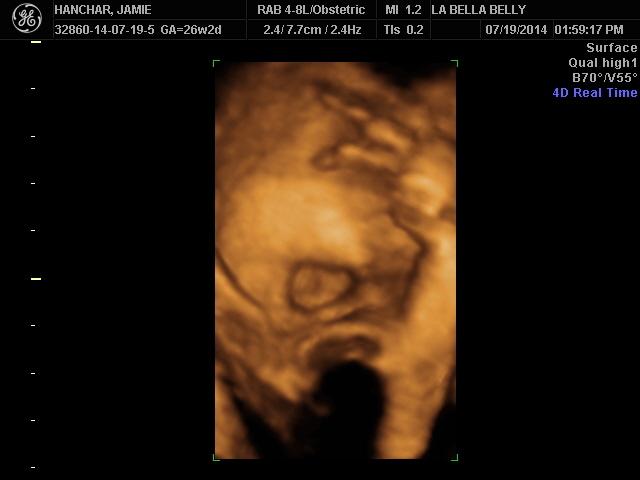 We’ve announced it on Facebook quite a few weeks ago and are now 24 weeks along as of today. It’s actually been a fairly easy pregnancy so far, with the exception of severe bronchitis at around week 7 where I thought I might just die, and I’ve actually been one of those pregnant women that other pregnant women love to hate. Not a ton of nausea, no real morning sickness, fairly decent energy, not many side-effects, etc. Now that I’ve gone public with all that, I’m sure my pregnancy will turn around and bite me in the tooshie, but so far, I feel great!!! 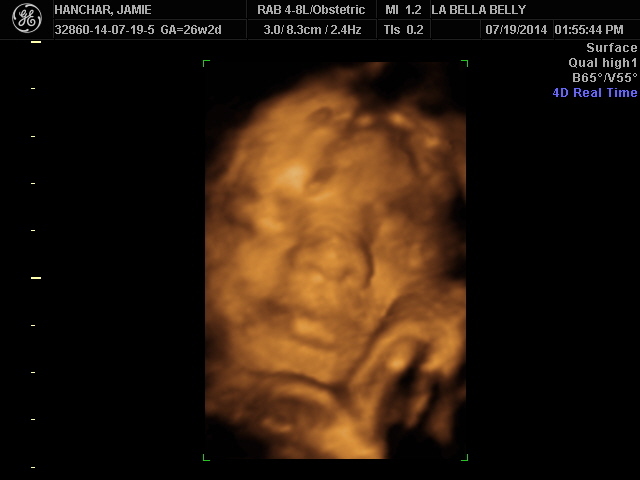 We were so excited at the beginning we decided to go to one of those boutiquey places popping up for their “Early Gender Determination Ultrasound” and they told us our baby was a boy. 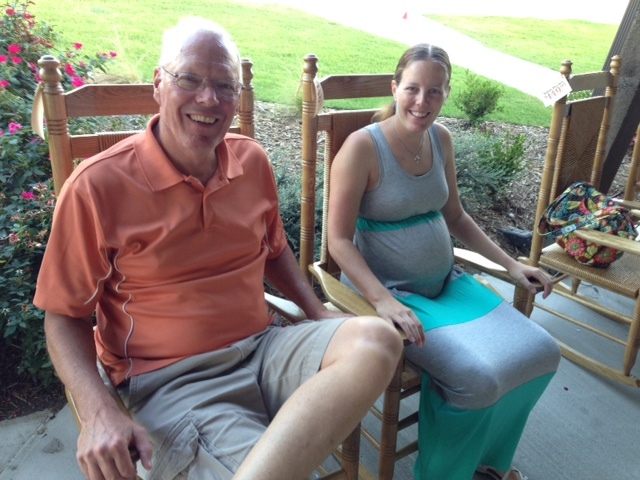 Imagine our surprise when 3 weeks later we had our anatomy scan at our doctor’s office and HE turned out to be a SHE! I couldn’t stop laughing, and Wade was just stunned speechless (He was SURE he’d seen the bits). 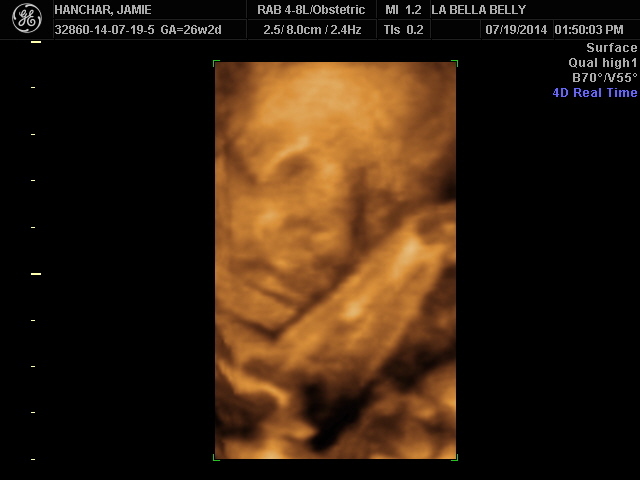 She has since been confirmed a girl twice, so we’re fairly confident this time. 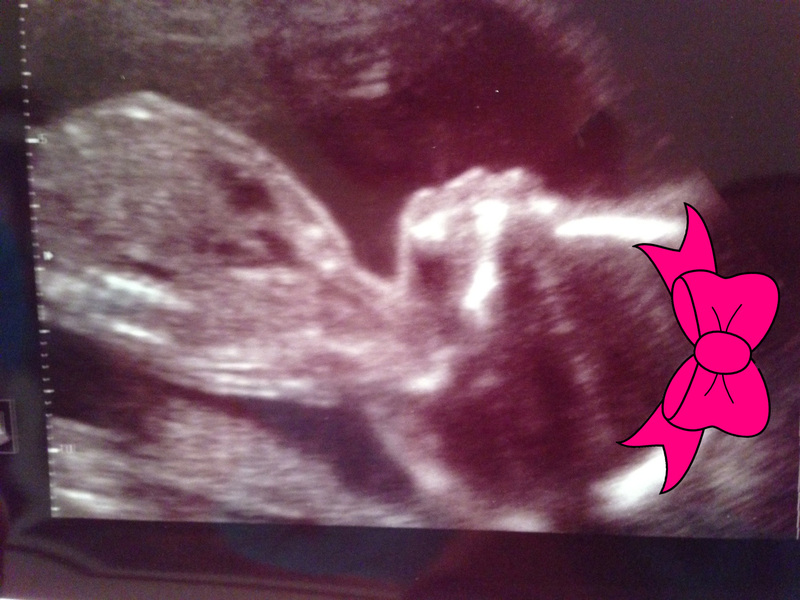 Looks like we’ll be welcoming Tatum Lynn to the family sometime around October 23 of this year. Around three and a half months left to go!!! All of our pets are also doing (knock on wood) surprisingly great! After two really close calls with Aspen since Christmas, she’s almost completely recovered and though VERY old and starting to go a little senile, she’s in great shape and still trucking along. Such a tough old lady. Checkers (our cat) is in robust health as always, and Derby (the sheltie) has been doing great as well! He turned 8 this year, and I just can’t believe how time has flown!! !